If you’ve ever thought you’d like to be a vampire then DarkEden might just be the MMORPG for you. 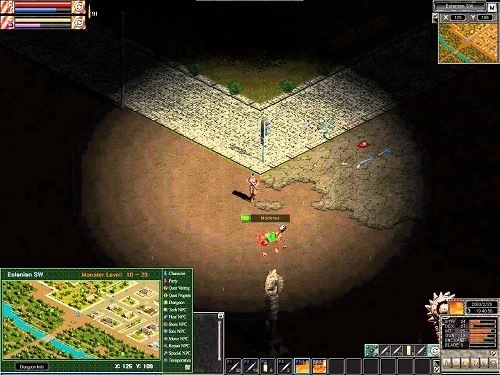 The game holds the title for one of the oldest MMORPGs and was originally released in 1997 (Korea) with an English version in late 2011. DarkEden uses an isometric view similar to that first Diablo game and even plays very similar to the first instalment in the Diablo franchise. Don’t let the age of the game scare you off as the game is an impressive MMO with 3 very unique classes that progress in different ways. Players can choose to play as an ouster, vampire or slayer in DarkEden. The game is designed in such a way that each race is at war with the other races with each having their own advantage. Ousters prefer melee combat and are all female characters, they make great first characters as they gain experience the fastest. Ousters play like most other characters in MMORPGs, they level up through experience which then unlocks skill points and stat points. While vampires increase their stat power through combat and can turn other races into vampires by biting them (provided no cure is used in time). Vampires also have the most restrictive inventory and can only equip accessory items. Slayer is the final available class and as the name suggests focuses on the slaying of vampires. Slayers can only gain experience through combat and use the largest number of weapons which includes both melee and ranged options. A day/night cycle is also present in the game world with vampires obviously having the upper hand at night time while being the weakest class during the day hours. DarkEden has plenty to get you hooked and a uniqueness that most new games simply lack. Play as a vampire, slayer or ouster. Day/night system that gives vampires an advantage at night (and weakness during day). The three available classes level up in completely different ways. A Diablo like feel to gameplay (Diablo 1). One of the oldest games in the genre, launching in 1997.